The group has had some t-shirts made with an embroidered crest on them. 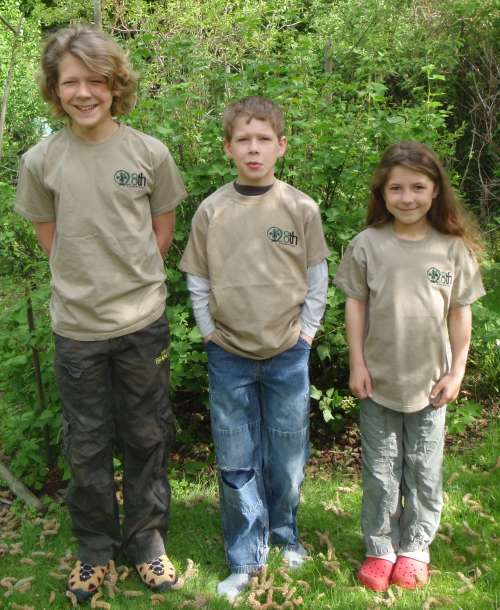 The t-shirts are good quality cotton are made by Fruit of the Loom and cost £9.00 each. Although they may shrink if agressively tumble-dried by mistake (like we did), rewashing restores them (almost) to their original size. The crest can be ironed and will not peel off as it is embroidered into the fabric of the shirt. You can order online via the email link below. 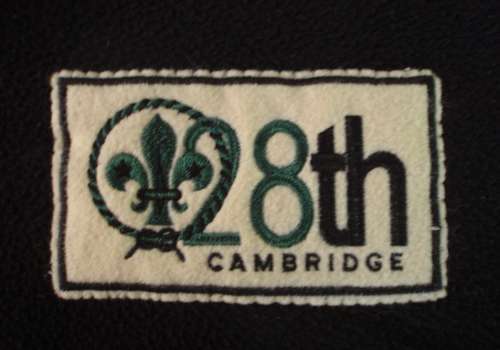 The same design is also available as a large camp blanket badge. The price at £3.50 isn't expensive, although not as attractive as the shirts, but it is still a great centerpiece for your camp blanket. Measuring 65x111mm, it is embroidered and comes with a finished edge, ready to sew onto your blanket. It can be ordered using the email link below. If you would like a t-shirt or camp blanket badge, please drop us an email, detailing how many shirts of which sizes and how many blanket badges. Your shirt should be ready for collection from one of our Tuesday meetings at the hut within two weeks, but we will confirm this by email.